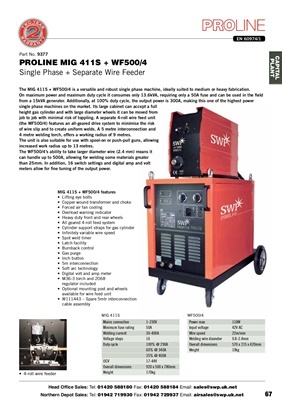 The MIG 411S + WF500/4 is a versatile and robust single phase machine, ideally suited to medium or heavy fabrication. 4 metre welding torch, offers a working radius of 9 metres. allowing increased work radius up to 13 metres. meters allow for fine tuning of the output power.